Like a lot of kids who grew up in the late 70’s/early 80’s, I was absolutely enthralled with a picture book called Masquerade. The book, written and illustrated by Kit Williams, could be read as a standard child’s fable about the moon falling in love with the sun, but it was designed as a real-world treasure hunt: Follow the subtle clues dropped throughout the book, and you’d discover the location of a very real hand-made jewel, valued at the time at $5,000. My father brought the book home one day as a gift and I was hooked. I was sure I would be able to solve the riddle. I couldn’t, and neither could any of my friends–but it was extraordinary fun trying, and it was a great mental workout. To this day, the complexity of the riddle floors me. Kit Williams created another puzzle book, where the challenge was to discover the book’s very title, before returning to his chosen career of painting. 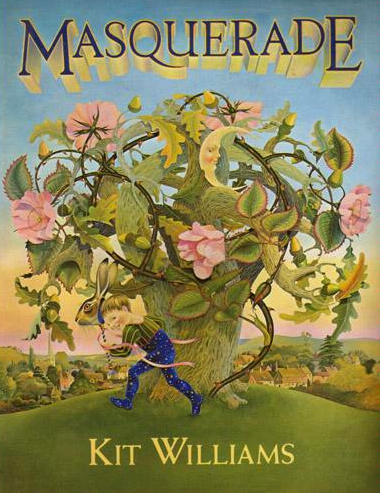 There’s a great (out-of-print) paperback edition of Masquerade that gives the answer, but I was looking for even more detailed information–a complete breakdown of all the puzzles and the paintings’ clues. When I went to look for information on the Kit’s books online, I couldn’t find much, so I created this site in 1998. Since that time, I’ve received a significant amount of detailed information — news articles, puzzle interpretations, rare interviews — and I’ve woven that info into the site as well, both in the analyses of the paintings and the collection of frequently asked questions. I am extremely grateful for these contributions, and have tried to give credit to the contributors wherever I could. I don’t have all the answers–and I’m not going to offer all the answers I have in some cases, so as not to ruin the fun for newbies–but I will share most of what I know, plus I hope to find answers to some of my own questions. Explore each painting, learn about the book’s history in the FAQ section, and have fun!